>We love you girl!! I agree with Jon…you deserve all the best!! You are an amazing woman! I am so glad I have gotten to know you and are now able to call you a friend! >Great story! Now I understand the jersey tweets LOL! >What a great story! Jon is one of life's rarities(is that a word? haha). He is a genuinely nice guy who cares about his fans. 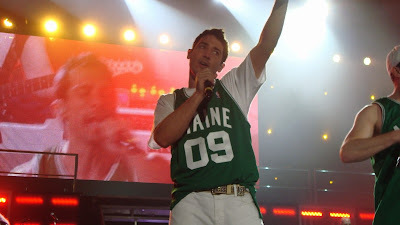 I'm so happy the Jersey found its way back to you! >Oh now I understand the tweets! 🙂 Thanks for sharing this story. I'm so glad the jersey made it back to it's rightful owner. And very happy to hear how. Jon really does have a heart of gold. >This is a great story Jessica. You don't know me that well, but I follow you and u crack me up. I enjoy reading your tweets, u r blunt,funny, honest and humble. 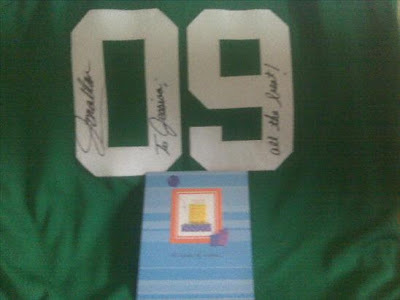 >Very cool Jessica, I am glad that you got your jersey finally, lol. Way to go Jon and all the other conspirators in this mission!! >He Jessica, what a fantastic story! Knew only the first half (you getting it in Maine and then having to return it). Truly moving what Sissy amd Lauren did for you, they really really prove that there are people out there who care and walk the extra mile (or give the extra dollar 🙂 ), not only to help the cause, but especially to make somebody happy they care about! And you are right about Jon, he does keep his promises and this shows again what an amazing guy he is. Enjoy your jersey and the great memories attached to it! And thanks to Sissy and Lauren too, off course! >My hat is off to Sissy, Lauren, and the rest of the ladies who helped you with this. What incredible women! And a tip of the hat to Jon, too. Your blog was so sweet it made me cry. Jon was so kind and nice to offer you the shirt off his back and I am glad it finally found its way to you. I was so happy for you when it arrived in the mail at your house yesterday. I always knew Jon would keep his promise to you!